We’ve been in the Red Centre of Australia for five days now, and have had two completely different trips during that time. We started our stay here in Alice Springs, then rented a car and drove the 500km (300 mi) to Uluru (Ayers Rock), camped there for two days, then back again. For me, this has been the most profound leg of our trip yet as it has also been for Eric, who writes about it beginning with his post here. 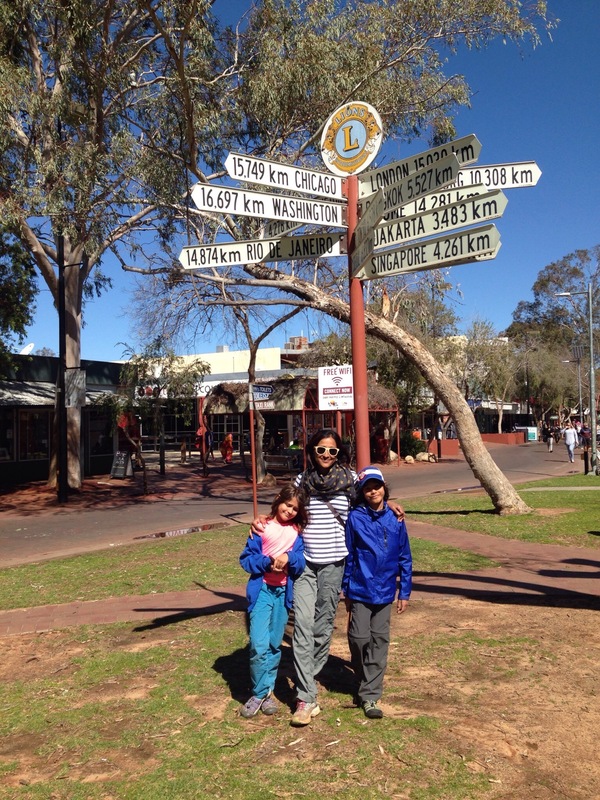 Alice Springs is a town of 28,000 people almost directly in the center of Australia. We landed in Alice Springs on a warm morning, found our hotel and wandered outside to have a look around. Tourist Alice Springs largely focuses on a pedestrian mall in town that covers 5-6 blocks and is lined with restaurants, souvenir shops and aboriginal art galleries. While I’ve traveled plenty to developing countries and seen the absolute destitution of communities there, it is always shocking to me to see that degree of poverty in a developed country. The closest I’ve gotten to seeing it in the US was when I spent a month at Whiteriver, a Native American reservation in Arizona. On this day we walked around the mall, finalized our car rental plans for the next day and then went to a wonderful Aboriginal art gallery which was marked by a focus on cooperation with the artists, so that they were fairly paid for their work. We spent a lot of time talking with the owners, Ric and Karl, about the art in their gallery, Yubu Napa, and how they approached the artists in a fair and respectful way and how many of the gallery owners in town would be dismissive of the artists or pay them a pittance or worse, in alcohol. We fell in love with a beautiful piece of art, titled “Budgerigar Dreaming” and bought it for our home. 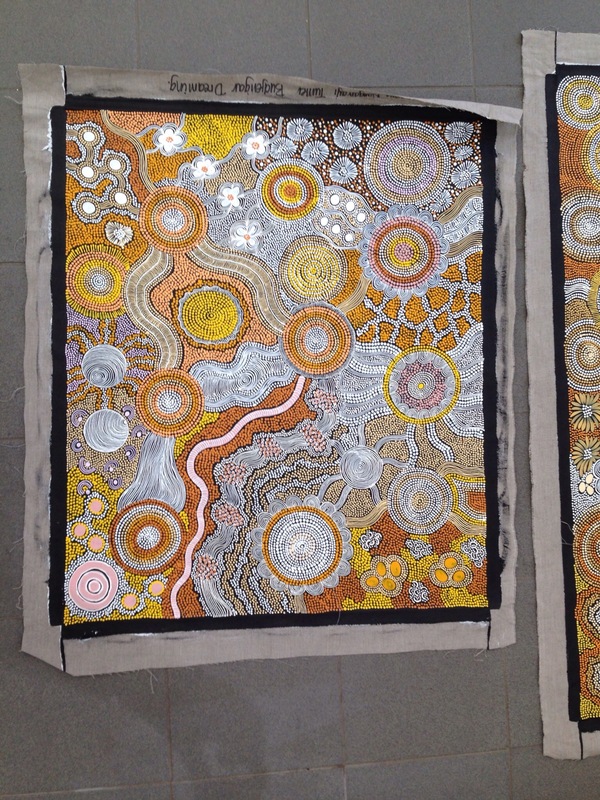 It represents how the indigenous people would search for waterholes in the land and the walkways between them. As it turned out, the artist is the one currently in residence at the Uluru gallery, and we were able to meet her later there, which was very cool. The history of Aboriginal peoples begins, over 30-40,000 years ago, though for the purposes of the current situation it starts with the entry of the British population. The nutshell version of this is that the Aboriginal people had been doing quite well for themselves until the arrival of the British in the late 18th century, who brought diseases that decimated the native population and regarded the Aboriginal people as less thaqan human. The British also began to annex land for themselves as they did not feel the Aborigines had any concept of land ownership and then drove the Aboriginal people off their prior territories. The Aborigines were nomadic to a degree but largely stayed within their territorial area – while they did not have a specific home as we think of one now, they did have a large area which was their “home base”. British people brought grazing animals to the land, which reduced resources for native animals and plants the Aborigines depended upon, and provided easy hunting for the Aboriginal people which enraged the settlers. Later on, many mixed race aboriginal children were forcibly taken from their families to be sent to educational “camps” and instructed in the ways of the civilized Europeans. Needless to say, these were not pleasant places to be and stories of abuse are rampant. The practice ended only as recently as 1969. Aboriginal people didn’t have the full right to vote until 1964! Does any of this sound familiar? It seems to me nearly identical to what happened in America with the Native American population there, at least when looked at with broad strokes. Aboriginal populations today have high rates of poverty, poor health, and a shorter life expectancy than non-Aboriginal populations. Only 59% complete education to a 12th grade level. Substance and alcohol abuse are rampant in the communities. More darkly, domestic violence, child abuse, and sexual abuse including sexual abuse of children is rampant, and felt to be under reported even so. Even worse, some of the articles I’ve read suggest that this is now so entrenched in culture that it is felt to be normal and not seen as bad by many communities. A few articles I’ve read have said that even prior to colonization, violence and abuse were part of Aboriginal culture, and that it has only magnified with the poverty and alcoholism of the current community. Our tour guide at Uluru, James, who is of the Anangu, said that the school in the area only went to 6th grade – for further education they would have to move to Adelaide, and even then the school located there was of poor quality. Many aborigines today do not possess a high degree of literacy, which prevents them from having jobs. Moreover, there are cultural issues which don’t mesh with the western world’s expectations – James told us of an example where he put in for his two weeks leave to go home for a ceremony. Six weeks later, the ceremony was still ongoing and had not completed, however he had to basically tell his grandfather that he had to leave else he would lose his job. When he came back, there had unsurprisingly been a lot of tension with his bosses – where had he been for those four extra weeks? Amazingly, he didn’t get fired – I can’t imagine any job where you could just not show up for four weeks! The government has now authorized “ceremony leave” for five days at a time, which doesn’t seem enough for man Aboriginals. To me, this anecdote demonstrated the significant cultural gaps that exist. Still…it’s a largely western world that we live in now and there has to be some way to find a balance between the two. I’m aware that all of this is from a outsiders perspective, and that I’m sure I’m barely scratching the surface of anything. The overall impression I have of Aboriginal culture is that of an impenetrable society, and yet it’s deeply sad to see people living as many of them currently are. I’m not invoking the idea of the noble savage or to suggest that Aboriginal peoples lived in a pristine world in harmony with nature and themselves before the white man arrived, but only to say that the current situation is troubling.